A few weeks ago I took a shot at Gary Edwards' fuzzy math on population change in Thurston County. In this post I wanted to take a closer look at the deeper assumptions in what he's trying to get at. His point (basically) was that although the population has increased in Thurston County, the number of deputies has stayed the same. The problem was that the population has increased (in unincorporated Thurston County) only half the amount he claimed. Which is okay, from his point of view, I suppose because population still went up while the number of deputies stayed flat. But, that statement seems to assume a result, such as an increase in crime. So, let's take a look. 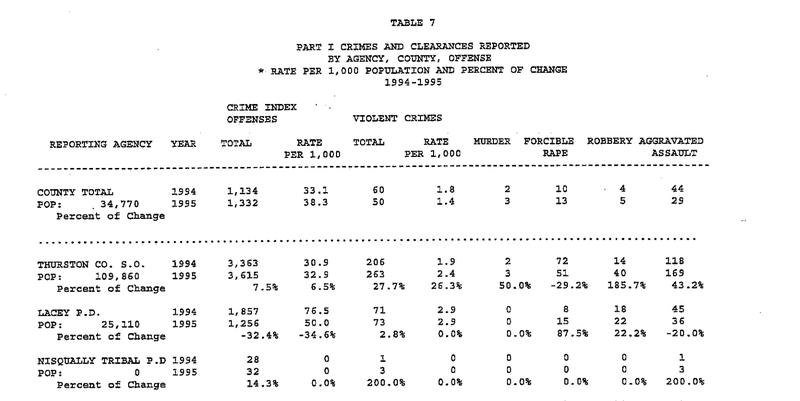 So, what it looks like here is that the crime rate did go up in Thurston County, but not nearly the rate that it increased in Lacey and Olympia. If we have a problem with an increase in crime, its in the urban areas, not in rural Thurston County with its stable level of policing. Every police department has seen a decrease in the number of police on patrol compared to the population. By this metric, the ratio of police per person has dropped the least in the Thurston County sheriff's office than anywhere else locally. So, while Edwards is still right that population went up and the level of policing stayed stable, he's implying a connection that really isn't there. The Thurston County sheriff's department saw a stable cop to resident ratio (compared to other local law enforcement departments) and this did not result in an increase in crime. Also, here's the spreadsheet (plus references) I was working from all along, just in case you want to check my math. This is terrific enterprise reporting. It deserves wide distribution. First metric: I don't think it can be sold that a 9% increase in crime is not a problem, particularly in what has generally been a safe community. The other cities have their own forces, their own policies, and their own law enforcement issues. 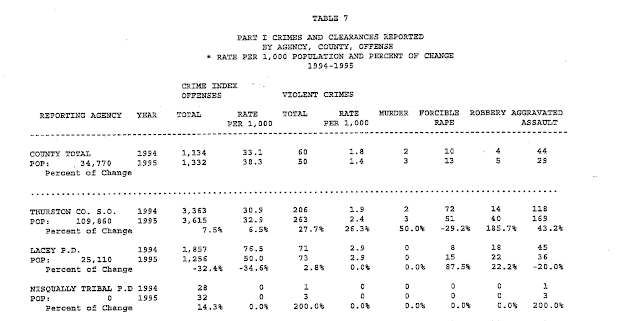 1995: 2430 citizens per officer = 192013 population/79 deputies. 2015: 3280 citizens per officer = 262388 population/80 deputies. @ Justin, the ratios I used, IIRC, were from the WSPC report.